Lacey Turner as Molly Dawes. Our Girl is a 90-minute drama on BBC1 at 9pm this Sunday. Written by Tony Grounds and starring Lacey Turner, I highly recommend it. A story of one young person’s struggle and hope for the future. You can learn more in my story below, published the day after the London press launch earlier this month. Followed by my transcript of the Q&A with Lacey, Tony and producer Ken Horn. Edited to remove any really major spoilers. 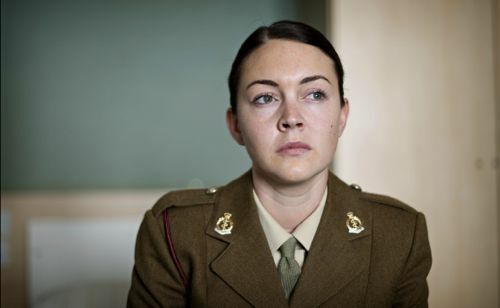 EX-EastEnder Lacey Turner shed real tears when filming BBC1 Army drama Our Girl. The former Albert Square actress plays new recruit Molly Dawes who trains to serve in Afghanistan. Lacey, 25, wept while filming a scene in a military cemetery, part of a real war graves tour that all potential squaddies experience during their training. Molly uses her mobile phone to call her mother and leaves an emotional voicemail while standing among the last resting place of the fallen. “The scene in the graveyard was pretty much my imagination and my mum,” revealed Lacey. She also thought of her mum for scenes where Molly has to write a “letter from the grave” to her parents, in case she is killed in action. Tears flowed when the cast filmed their fictional Passing Out Parade at the Army Training Centre in Pirbright, Surrey. Lacey and other cast members marched alongside 200 real trainees doing a final parade ground rehearsal on the eve of their own big day when they finally became soldiers. “That was the scariest moment of my life so far. Because I felt if I put a foot wrong, it was their real rehearsal. “As I walked on to the Passing Out Parade I was actually crying with fear because I felt like it was just going to go like dominoes and it was all going to be my fault. One Army General even mistook Lacey and other actors for real soldiers and congratulated them. One of five children, bleached blonde Molly works in an East London nail bar and fears a dead end future is all mapped out for her. But she decides to train to join the Royal Army Medical Corps after throwing up outside an Army recruitment office on her 18th birthday. 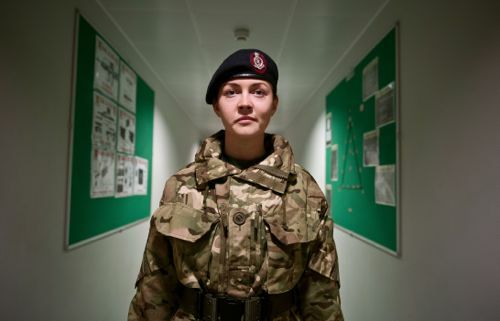 Written by award-winning Tony Grounds, the one-off 90-minute drama shows her journey through training to active service as an Army combat medic in Afghanistan. Lacey admitted: “I thought I was quite fit and then when I got to the training centre I realised I wasn’t. “So I did a lot of fitness training and spent hours marching round the car parks in Borehamwood, which was fun. She added: “I did lose a bit of weight and tone up. I think it was a bit of a shock to the system. “But the food there is just carbs. It’s my favourite things like sausage, chips and beans and shepherd’s pie. Lacey said she had total respect for everyone in the Army but could not do the job for real. “I’d like to do the training but I don’t know that I’d ever get on the plane to actually go. I don’t think I’m brave enough. “It’s such an amazing thing that they do. They risk so much and I’m not that brave. But I did really enjoy the training. “You got to play with rifles and swing off bars and meets loads of different people. “I waited weeks to fire a gun. It was brilliant. I wasn’t allowed live rounds. But it was fun. Something you don’t really get to do that often. 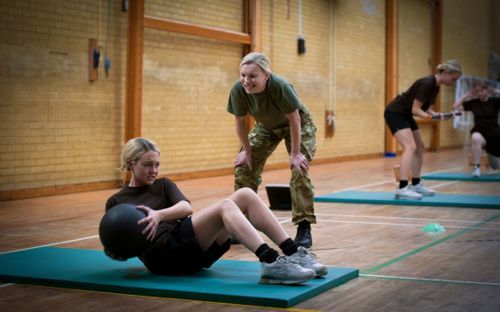 Our Girl is on BBC1 at 9pm on Sunday March 24. Q: What was going through all the training like, Lacey? Q: Lacey – you were virtually in every scene. What was that like for you? Q: Can I ask Tony where the idea for this came from and also what the research process was like? Q: And these diaries came from recruits at Colchester or Pirbright? Q: (From me as it happens) Lacey – did you know much about Army life before you got this project and did you do any of your own research? Q: The drama itself was quite ambiguous about whether the Army is cult or family. I wondered, Lacey, if you had a view on that having played the part? 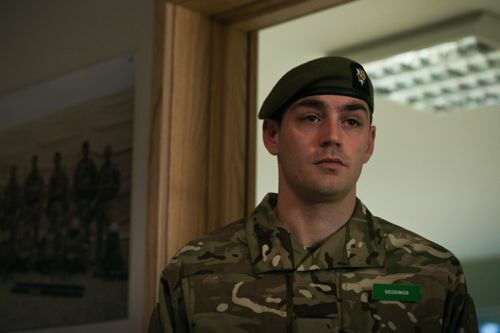 Matthew McNulty as Corporal Geddings. Q: Were you quite impressed by your experience with the Army? Q: Lacey – if you did have to do this, what was it like writing a letter from the grave and do you think you could actually have been a soldier in real life having now gone through the training process, or part of it? Q: Which side of Molly you preferred playing, the blonde, drinking one or the Army one? Q: (Me again) Just further to what you said, Lacey, a moment ago about the letter…the tears in the graveyard – it might be a testament to your acting abilities but they looked very real on screen. How did you approach that and what were you thinking of? And also did you speak to any recruits or anybody else about the prospect of going out somewhere and perhaps not coming back again? Q: (Me again. Sorry.) And the Passing Out Parade? Was that filmed at the same time as a real Passing Out Parade? How was it filmed? Q: Is it right that the Army didn’t know that Lacey or Matthew were in the real Passing Out Parade? Q: Lacey – did you lose any weight by going through the training process? Did you tone up very much? Q: (Final one from me) Tony – are you happy with the amount of West Ham references you managed to get in? Was it difficult to get that location (Molly’s family home overlooking the Boleyn Ground)? Q: The issue of areas like this being multi-cultural and people joining the Army to fight in Muslim countries? Q: Is there the potential for a series here? Q: Has the BBC indicated whether they’d like a series or is it too early to say? Posted in News and tagged Army, BBC Drama, BBC1, EastEnders, Ken Horn, Lacey Turner, Matthew McNulty, Our Girl, Pirbright, Pirbright ATC, Tony Grounds. Bookmark the permalink. Seeing this program has opened up my mind to the reality of life , a young girl like Lacey Turner who loved going out with her friends and smoking and drinking, turned her life around and pushed herself to the limit to fight for the one thing that inspired her and made her understand life . It makes you think of all the heroes out there who’s life’s could be the exact same as hers and they have done something with it . The fitness levels , leaving people you love behind , and learning respect ! This was an amazing peice and hopefully series will come out of this as I would expect the audience level will grow and Our Girl will become the next great thing ! Very good, and thoroughly enjoyable. Well written, well cast, and well acted. It would be lovely if this excellent drama were to be the precursor of a return of the one-off play to our screens! Was the pub featured in the dram the Earl of Wakefield. That’s what I wanted to know. thought it was thew boleyn at first but it wasn’t. I really liked it and was actually disappointed to find out it wasn’t already a series when I came on the internet to find the rest of it! Superb drama – a credit to BBC was Lacey and the cast and crew. Never been so gripped by a drama before. Thought it was gonna be another missing girl story, be this was truly far beyond belief and a total astonishment, not having read any reviews prior to airing. Shows a true life of the British Army today and what it can do for and offer young people in todays society, no matter what history or background. Well done BBC Drama Team and to the cast & crew of Our Girl. Lets wait for the BBC for a series please!! Also Ian, fantastic interview as tweeted! Don’t want to spoil it for those who have yet to see. So if that’s you…read no further! We heard Molly reading out her “letter from the grave” which she had finally written. But her parents were at home watching the Brize Norton repatriation of the body of another “Our Girl”. With her mum reassuring her dad: “Our girl will be all right.” So Molly lives on but, of course, always at risk – like her colleagues – of paying the ultimate sacrifice.